Adrienne d’Evreus is a marvelously science-minded artist. 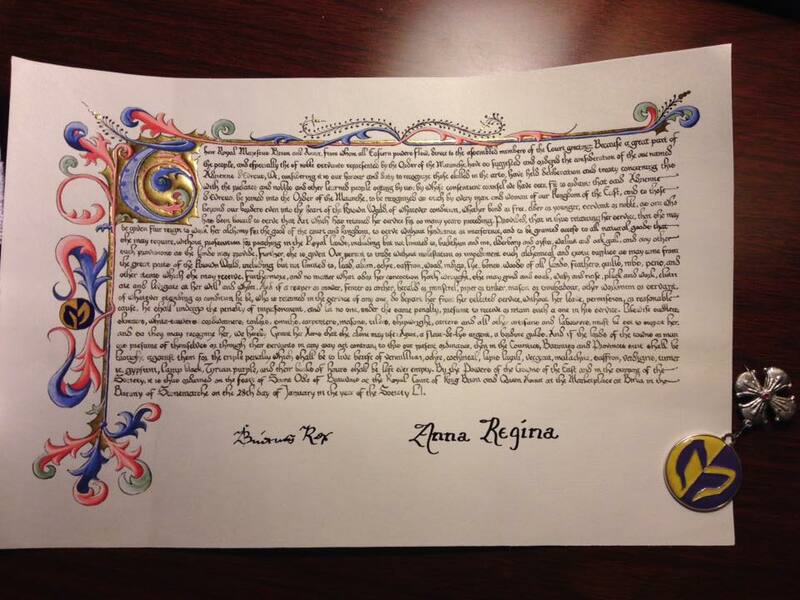 I was invited to create words for her induction into the Order of the Maunche. Her Laurel, Mistress Isabel Chamberlain, lives far off, in another kingdom now, and so the scroll had some transit required! The desired piece required charter text, which is most appropriate for her persona. After a fair amount of looking and tossing a lot of sources, I decided that I’d use the “The Statute of Laborers, 1351” as the base of the text. The language has a great sound to it but it’s actually a somewhat harsh document. (You can learn about the statue here: https://en.wikipedia.org/wiki/Statute_of_Labourers_1351). I adapted it heavily to keep the quality of the language and some of the themes, especially parts related to artists, and included my own riff on things as I listed items appropriate to her art and research projects, found on her blog. My goal was to have about 500 words. When done, it was 599 but I really liked it, so I sent Isabell it and an edited one. She chose the larger work to use in the scroll. 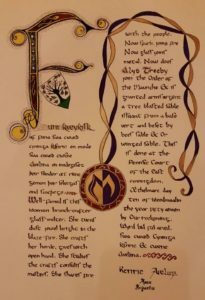 Scroll for Adrienne d’Evreus for the Order of the Maunche, made by Mistress Isabel Chamberlain with words by Mistress Aneleda Falconbridge. Their Royal Majesties Brion and Anna, from whom all Eastern powers flow, direct to the assembled members of the Court greeting. Because a great part of the people, and especially the of noble servants represented by the Order of the Maunche, have so suggested and ordered the consideration of the one named Adrienne d’Evreus, We, considering it is our honor and duty to recognize those skilled in the arts, have held deliberation and treaty concerning this with the prelates and nobles and other learned people sitting by us; by whose consentient counsel we have seen fit to ordain: that said Adrienne d’Evreus, be joined into the Order of the Maunche, to be recognised as such by every man and woman of our kingdom of the East, and to those beyond our borders even into the heart of the Knowne World, of whatever condition, whether bond or free, elder or younger, servant or noble, as one who has been bound to serve that Art which has retained her service for so many years preceding. Provided, that in thus retaining her service, that she may be given fair reign to work her alchemy for the good of the court and kingdom, to serve without hindrance or interference, and to be granted access to all natural goods that she may require, without prosecution for poaching in the Royal lands, including but not limited to, buckthorn and iris, elderberry and oyster, walnut and oak gall, and any other such provisions as the lands may provide. Further, she is given Our permit to trade without molestation or impediment such alchemical and exotic supplies as may come from the great Ports of the Knowne World, including but not limited to, lead, alum, ochre, saffron, woad, indigo, lye, bones, woods of all lands, feathers, quills, nibs, pens, and other items which she may receive. Furthermore, and no matter what odor her concoction hath wrought, she may grind and soak, wash and rinse, pluck and work, elutriate and levigate at her will and whim. And if a reaper or mower, fencer or archer, herald or minstrel, piper or tinker, mason or troubadour, other workman or servant, of whatever standing or condition he be, who is retained in the service of any one, do depart her from her selected service, without her leave, permission, or reasonable cause, he shall undergo the penalty of imprisonment, and let no one, under the same penalty, presume to receive or retain such a one in his service. Likewise saddlers, skinners, white-tawers, cordwainers, tailors, smiths, carpenters, masons, tilers, shipwrights, carters and all other artisans and labourers, must be set to support her, and so they may recognize her, we hereby Grant her Arms that she alone may use: Azure, a fleur-de-lys argent, a bordure gules. And if the lords of the towns or manors presume of themselves or through their servants in any way to act contrary to this our present ordinance, then in the Counties, Baronies and Provinces suit shall be brought against them for the triple penalty which shall be to live bereft of vermillion, ochre, cochineal, lapis lazuli, vergaut, malachite, saffron, verdigris, turmeric, gypsum, lamp black, Tyrian purple, malachite and their books of hours shall be left ever empty. By the Powers of the Crowns of the East and in the support of the Society, it is thus ordained on the Feast of Saint Odo of Beauvais at the Royal Court of King Brion and Queen Anna at the Marketplace at Birka in the Barony of Stonemarche on the 28th day of January in the Year of the Society LI. Edward by the grace of God etc. to the reverend father in Christ William, by the same grace archbishop of Canterbury, Primate of all England, greeting. Because a great part of the people and especially of the, workmen and servants has now died in that pestilence, some, seeing the straights of the masters and the scarcity of servants, are not willing to serve unless they receive excessive wages, and others, rather than through labour to gain their living, prefer to beg in idleness: We, considering the grave inconveniences which might come from the lack especially of ploughmen and such labourers, have held deliberation and treaty concerning this with the prelates and nobles and other learned men sitting by us; by whose consentient counsel we have seen fit to ordain: that every man and woman of our kingdom of England, of whatever condition, whether bond or free, who is able bodied and below the age of sixty years, not living from trade nor carrying on a fixed craft, nor having of his own the means of living, or land of his own with regard to the cultivation of which he might occupy himself, and not serving another,if he, considering his station, be sought after to serve in a suitable service, he shall be bound to serve him who has seen fit so to seek after him; and he shall take only the wages liveries, meed or salary which, in the places where he sought to serve, were accustomed to be paid in the twentieth year of our reign of England, or the five or six common years next preceding. Provided, that in thus retaining their service, the lords are preferred before others of their bondsmen or their land tenants: so, nevertheless that such lords thus retain as many as shall be necessary and not more; and if any man or woman, being thus sought after in service, will not do this, the fact being proven by two faithful men before the sheriffs or the bailiffs of our lord the king, or the constables of the town where this happens to be done,-straightway through them, or some one of them, he shall be taken and sent to the next jail, and there he shall remain in strict custody until he shall find surety for serving in the aforesaid form. And if a reaper or mower, or other workman or servant, of whatever standing or condition he be, who is retained in the service of any one, do depart from the said service before the end of the term agreed, without permission or reasonable cause, he shall undergo the penalty of imprisonment, and let no one, under the same penalty, presume to receive or retain such a one in his service. Let no one, moreover, pay or permit to be paid to any one more wages, livery, meed or salary than was customary as has been said; nor let any one in any other manner exact or receive them, under penalty of paying to him who feels himself aggrieved from this, double the sum that has thus been paid or promised, exacted or received and if such person be not willing to prosecute, then it (the sum) is to be given to any one of the people who shall prosecute in this matter; and such prosecution shall take place in the court of the lord of the place where such case shall happen. And if the lords of the towns or manors presume of themselves or through their servants in any way to act contrary to this our present ordinance, then in the Counties, Wapentakes and Trithings suit shall be brought against them in the aforesaid form for the triple penalty (of the sum) thus promised or paid by them or the servants; and if perchance, prior to the present ordinance any one shall have covenanted with any one thus to serve for more wages, he shall not be bound by reason of the said covenant to pay more than at another time was wont to be paid to such person; nay, under the aforesaid penalty he shall not presume to pay more. Likewise saddlers, skinners, white-tawers, cordwainers, tailors, smiths, carpenters, masons, tilers, shipwrights, carters and all other artisans and labourers shall not take for their labour and handiwork more than what, in the places where they happen to labour, was customarily paid to such persons in the said twentieth year and in the other common years preceding, as has been said; and if any man take more, he shall be committed to the nearest jail in the manner aforesaid. Likewise let butchers, fishmongers, hostlers, brewers, bakers, pullers and all other vendors of any victuals, be bound to sell such victuals for a reasonable price, having regard for the price at which such victuals are sold in the adjoining places: so that such vendors may have moderate gains, not excessive, according as the distance of the places from which such victuals are carried may seem reasonably to require; and if any one sell such victuals in another manner, and be convicted of it in the aforesaid way, he shall pay the double of that which he received to the party injured, or in default of him, to another who shall be willing to prosecute in this behalf; and the mayor and bailiffs of the cities and Burroughs, merchant towns and others, and of the maritime ports and places shall have power to enquire concerning each and every one who shall in any way err against this, and to levy the aforesaid penalty for the benefit of those at whose suit such delinquents shall have been convicted; and in case that the same mayor and bailiffs shall neglect to carry out the aforesaid, and shall be convicted of this before justices to be assigned by us, then the same mayor and bailiffs shall be compelled through the same justices, to pay to such wronged person or to another prosecuting in his place, the treble of the thing thus sold, and nevertheless, on our part too, they shall be grievously punished. And because many sound beggars do refuse to labour so long as they can live from begging alms, giving themselves up to idleness and sins, and, at times, to robbery and other crimes-let no one, under the aforesaid pain of imprisonment presume, under colour of piety or alms to give anything to such as can very well labour, or to cherish them in their sloth, so that thus they may be compelled to labour for the necessaries of life. gesæt þeir sundor æt rune. Gemon þeir selesecgas ond sincþege. sable and Or, winged sable. Cyninga Kenric and Cwene Avelina. Well-famed is this woman, brooch-crafter, glass-melter. She turns dust jewel-bright in the blaze-fire. She crafts her hoard and gives with open hand. She studies the crafts and consults the masters. She has shares fire with the people. Now spark joins fire, now glass joins metal. Now Alys Treeby joins the Order of the Maunch and is granted arms, Argent, a tree blasted sable issuant from a base vert and beset by bees sable and Or, winged sable. This is done at the Pennsic Court of the East, cyningdom Aethelmarc, on day tīen of Weodmonað in the year fīftiġ ānum by our reckoning. The text is influenced by portions of the Havamal and the Anglo-Saxon portions are taken from the texts of the Havamal. A facing page translation is available online here: http://www.anglo-saxons.net/hwaet/?do=get&type=text&id=Hav. Ri Kenric and Bean-righ Avelina call to their people to listen. Praise is the mead of those who make impressions. Spear-tall stands Seamus shire-maker, saffron-robed, armed to raid. A man of great worth, ceithearn* and crafter of Clan Cnoc Gorm, he walks the wood-lands in soft silence. Tiarna Seamus na Coille Aosda knows all things which a forest-man should know, to weave and sew, to cut and fletch, to dye and work wool and leather. He bends the yew and makes for it a singing string. He fletches the arrow that feeds the clan. He sets the snare and praises the prey. He strikes the stone and brings forth sparks. He heats and strikes the iron to sharpness. He knows the trees both new and ancient. He forms fine things from them. He knows the stars and their directions. He sleeps beneath them in all weather. Rare-gift giver, Seamus steadies new birch sapling, binds and props the eldest yew. Ceithearn and crafter, shares Fintan’s wisdom with all who fish. This day sleeve-wearers seek his presence, bid him now to join their Order with arms-grant given, Argent, a trillium purpure barbed vert and seeded Or. In the fields of Malagentia, ringed with royal forest, the Maunche calls at the Great Northeastern Creach Rígh*on July’s ninth day, A.S. LI, at the Great Northeastern Creach Rígh* and it is the will of Ri Kenric and Bean-righ Avelina that this be done. And so it was done. ** The little fire that warms is better than the big fire that burns. Illumination by Lady Agatha Wanderer. 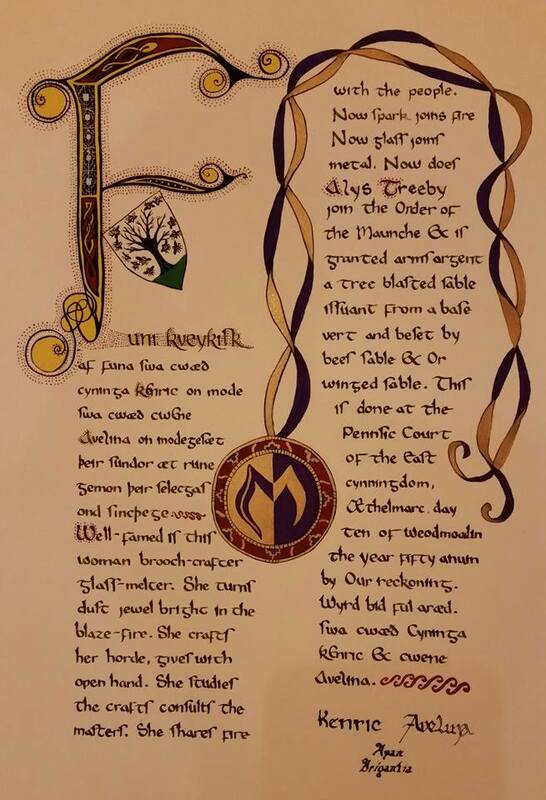 Calligraphy by Mistress Nest verch Tangwistel. Words by Mistress Aneleda Falconbridge. Scroll text inspired by the The Book of Anuerin, Cardiff MS 2.81. His intelligence is in his writing. We, King Kenric ap Essex and Queen Avelina Keyes, attest to the truth of this. It is with a pen that Lord Gideon ha-Khaza has shared his knowledge of fighting laws and histories of the Jewish people with the Knowne World. We bid him approach the Eastern scepter to be named a Companion of the Order of the Maunche, so recognized at the Coronation of Their Majesties Kenric and Avelina in the Shire of Quintavia on the ninth of April, A.S. L.
Illumination by Agatha Wanderer, Calligraphy by Alexandre St. Pierre, words by Aneleda Falconbridge. *Poem, “The Power of the Pen” by Samuel ha-Nagrid, is based on translations by David Goldstein and Peter Cole. Maunche for Christiana Crane, given at Birka AS 50. Words inspired by and adapted from “The Pearl” – a late 14th century Middle English poem by an anonymous author. Below it is in middle English and modern English. Worthé fraunchyse joye and blysse hereinne. I sette hyr sengely in synglere. and wel singe hyr dede once agayn. Oute of oryent, I hardyly saye. So fyne, so reken in uche araye. worthy franchise will have joy and bliss herein. and sing well of her deeds once again. So fine, so radiant in array. did Brennan King and Caoilfhionn Queen. Below are sections of “The Pearl” which inspired and guided the above text. Oure fraunchyse joye and blysse hereinne. Quere-so-ever one jugged letters gaye. 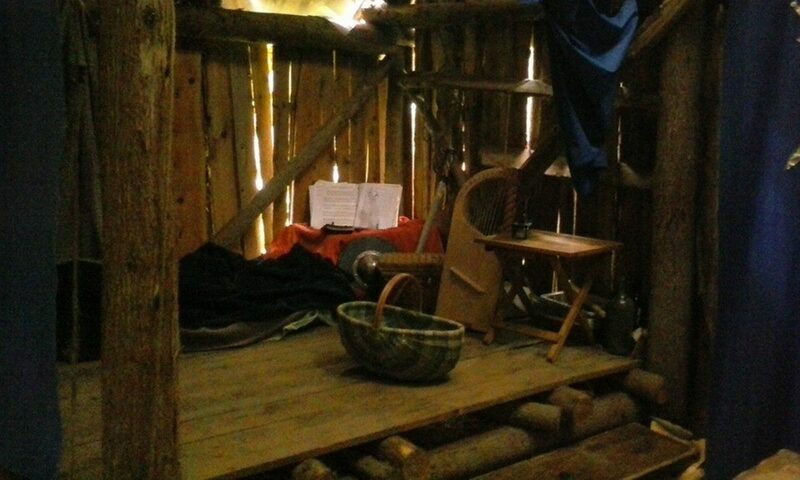 “Þat date of 3ere wel knawe þys hyne. And fynde3 þer summe to hys porpos. Keruen and caggen and man hit clos. And ydel men stande he fynde3 þerate. ‘Why stande 3e ydel?’ he sayde to þos. More courtly maiden there was none. so sing well of her deed and thought again. The gilt and gall wel knawe thys hyne. Ther tnys ne mornyng com never nere. Never can loss or grief come near. Mony ryal ray con fro hit rere. Blysnande whyt was hyr bleaunt. I knew hyr wel, I hade sen hyr ere. That maid, and knew her more and more. That fryth ther fortwne forth me feres. Nis no wyy worthé that tonge beres. No bonk so byg that did me deres. As fyldor fyn her bonkes brent. No man could render worthily. No height could do me injury. Lord, glorious was that splendour bright ! Garten my goste al greffe foryete. Of flaumbande hwes, both smale and grete. Thay songen wyth a swete asent. As here in all their splendour bright. Grant her arms, azure, a crane in its vigilance argent and a tierce ermine.